The human brain is a wonder to behold. It controls the function of every organ, tissue and cell of your body. But, what happens when there is a crossing of the wires? Does higher function of the brain decrease? What about posture? Movement? Ability to make good decisions? When we use electronic devices in a forward slumped posture, and let’s be honest is there any better way to check your snapchats, instagram or facebook feed then flopped onto the couch, we cause a sensory mismatch leading to degeneration of the brain. Some parts become under-stimulated while others become over stimulated. The frontal lobes are involved in motor function, problem solving, spontaneity, memory, language, initiation, judgement, impulse control, and social behavior. Essentially it is what makes you, you. When the frontal lobe is under-stimulated, such as when using a cell phone or playing a video game, motivation is lost, the ability to make good decisions is decreased, memory and problem solving is reduced. The parietal lobes are involved in sensation and spatial awareness. This is your ability to know where you are in space. When the parietal lobe is dampened it becomes difficult for your body to know where it is in relation to itself and other things, this increases your risk for injury and can lead to defused pain in the neck, back or shoulder. The cerebellum receives information from the sensory systems, the spinal cord, and other parts of the brain and then regulates motor movements. The cerebellum coordinates voluntary movements such as posture, balance, coordination, and speech, resulting in smooth and balanced muscular activity. By disabling the cerebellum smooth and accurate coordinated movement is reduced, resulting in an increased risk for injury and decreased athletic performance. The PMRF is very important for our body function. Not only does it run posture and muscle tone, but helps with blood pressure, heart rate, digestion and a whole host of functions that your body does automatically. There is more. Ninety percent of all your brain’s thinking goes to the PMRF and thus ninety percent of the feedback from the PMRF goes to your brain. If the PMRF is not working in this regard, it could have effect on our thinking. This could mean depression, anxiety, dark thoughts, or fearful thoughts. The occipital lobe is the visual processing center of the brain. When we spend prolonged time on electronic devices we are only stimulating our visual system. There is no social connection made, no problems to solve, not even any choices to be made. We simply process the visual stimuli. The temporal lobe is involved in primary auditory perception, such as hearing, and holds the primary auditory cortex. If we turn the sound up, this is especially prominent in video game use, we don’t only stimulate the occipital lobe but the temporal lobe as well. When the temporal lobe is over stimulated we actual decrease our ability to control our emotions and to make rational decisions. Thus “temper tantrums” are more accurately called “temporal tantrums” because they are usually due to an overstimulation of the temporal lobe. When TV, computers, cell phones and tablets become the center of our world they start doing our thinking for us. The parts of your brain you would want running at peak efficiency are damped while those that simply process stimuli are turned up to 11. You see the phones may be smart but the people becomedumb. The silver lining is that the brain is highly plastic. It is able to shape and form and change. 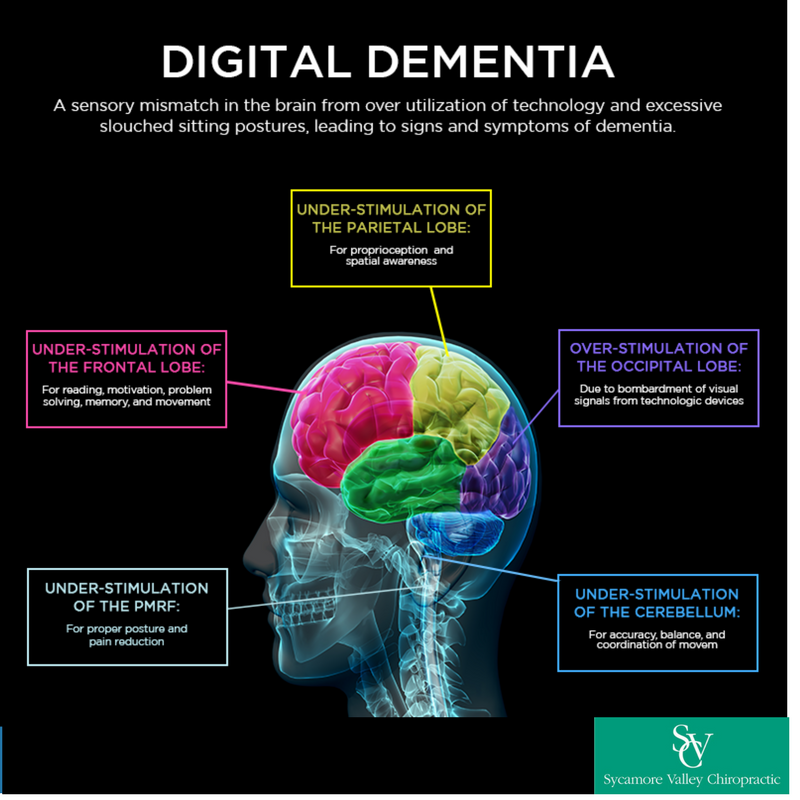 By making simple changes to you digital habits you can combat the effects of this Digital Dementia. If you are interested in learning how, give us a call (925) 837-5595 and set up an appointment, we would love to help you learn how to combat and overcome these effects.